A characterful and flexible analogue drum machine with some uniquely creative sequencing tricks up its sleeve - at a winning price. Two varieties of kick offer a fantastic range of low-end punch. Powerful and flexible sequencer. Can't record or automate sound parameters. Arturia is, it seems, a company that likes to keep us on our toes. While we're still waiting expectantly for the arrival of its mammoth MatrixBrute synth, which was announced back at NAMM but is yet to hit shelves, the French brand has served up something of a curveball with the arrival of the DrumBrute, an all-analogue drum machine announced out of the blue in early October and due to arrive in shops barely a month later. Housed in a chassis that mimics the size and design of the company's MiniBrute synth, the DrumBrute features 12 synth tracks offering a total of 17 drum and percussion sounds. Each of these 12 tracks is accompanied by a velocity-sensitive rubber pad for playing the associated sound, along with a range of rotary knobs for shaping the sonic character. Along the centre of the machine, a row of 16 rubber buttons allows patterns to be step-sequenced and edited either 'offline' or on the fly while the sequencer is running. As with its other recent hardware offerings, Arturia has struck a decent balance of digital and analogue I/O on the DrumBrute. In terms of outputs, we get a 1⁄4-inch main output jack along with 12 individual mini-jack outputs, one for each of the drum tracks (other than the open and closed hats, which share an output) and a metronome out. There is also a headphone output, with both mini and 1⁄4-inch output ports and a dedicated level control. On the synchronisation front, the DrumBrute has MIDI in and out ports, along with a USB connection which can send and receive MIDI/sync info and can be used to customise and edit settings and patterns using Arturia's free MIDI Control Center software. There are also mini-jack Clock In and Out ports, which can be set up to send/receive 1PPS, 2PPQ, DIN24, DIN48 signals for synchronisation with a variety of hardware units. Finally, a power input for the accompanying wall wart adaptor rounds off the back panel connections. From left to right the DrumBrute features two kick engines, a snare, a clap, rim/clave, closed hat, open hat, high tom/conga, low tom/conga, cymbal/reverse cymbal, maracas/tambourine and a synth perc sound, which is labelled Zap. DrumBrute is very intuitive and keeps the bulk of its parameters up-front and easily accessible. It's worth noting that, while one might assume that sounds that share a section, such as the rim and clave, can only be used in either/or manner, it's actually possible to sequence both at once. While both the rim and clave sound share front panel controls and the same output, it's possible to sequence both on the same step and have them play simultaneously. The exception to this is the closed and open hats, where the former always chokes the latter, despite them having individual pads and controls on the front panel. The DrumBrute is capable of saving and recalling up to 64 patterns (ie sequences of up to 64 steps) across its four memory banks. The instrument also features a song bank, which allows assortments of patterns to be chained together to create longer arrangements. The onboard memory has space for 16 songs, each of which can contain a chain of up to 16 patterns selected from anywhere in the DrumBrute's four memory banks. Arturia's free MIDI Control Center (MCC) software, meanwhile, allows an unlimited number of patterns and songs to be saved to a host computer, which can be uploaded to the DrumBrute's memory when it is sync'd over USB. The MCC also allows patterns to be edited on a DAW-like sequencer layout. type of messages sent via the Clock Sync ports, changing the device's MIDI channel and setting which MIDI notes correspond to each drum. Broadly speaking, the sounds are full-bodied and lean towards the grittier ends of the electronic music spectrum. The hats and cymbals have a not-unpleasant raspy, metallic quality. The reverse cymbal is particularly good; great for adding a bit of groove and build to drum loops, although it's a slight shame it doesn't have its own decay control independent of the main cymbal. The rim/clave and toms/congas are tight and punchy, with a real 'classic Roland' feel to them. Zap, meanwhile, provides an attack-heavy synth perc sound with a sweeping pitch envelope. With just pitch, level and decay controls, there's not masses of sound shaping potential, but it's still a nice little addition and great for adding a little melodic flavour to beat loops. The rim/clave and toms/congas are tight and punchy, with a real 'classic Roland' feel to them. As is often the case with synth drum machines, the snare and clap are probably the weakest of the sounds here. That's not to say either are necessarily lacking - the clap can range from tight to fairly drawn-out with a decent pitch range, and the snare in particular has plenty of sculpting options, with level, tone and decay controls for the 'snap' attack element, along with overall tone and level rotaries. By their nature though, synthesized claps and snares can sound a touch thin compared to the multi-layered, sampled drum hits we're used to hearing in modern productions, and you'll probably need to add a bit of drive, reverb or a tight delay to these to get them to cut through a mix, none of which are built into the DrumBrute. The two kicks are the DrumBrute's trump card, however. Each has a distinct sonic character and the two sit very nicely together. Kick 1 features a punchy pitch envelope and a sharp attack, both of which can be controlled by the Impact and Sweep rotaries. There are also Decay, Pitch and Level controls, allowing the creation of everything from tight, up-front kick sounds to filthy, Grime-like hits with an exaggerated punch. Kick 2, meanwhile, is more sub-heavy, with a deep, rounded low-end. There are just Decay, Pitch and Level controls here, but these provide enough tonal shaping to run the gamut from thudding Techno kicks to booming Hip-Hop-style 808 bass. On the workflow front, the DrumBrute is very intuitive and keeps the bulk of its parameters up-front and easily accessible. Our usual test with gear of this sort is to unbox it and dive right in to see how far we can get without the need to consult the manual. In the case of the DrumBrute it was only some of the deeper arrangement and synchronisation settings that eventually had us reaching for the instructions. Admittedly, having plenty of experience with other drum machines and x0x-style sequencers does help, but pretty much everything here is well positioned and clearly labelled, and even the more unique features are made to feel pretty self-explanatory. As mentioned, drum patterns can either be inputted using the 16 step buttons or recorded live, by hitting record and playing the pads. Note that by default record mode auto-quantises beats to the step sequencer, rather than capturing a truly 'live' performance, although it is possible to disengage quantise by hitting Shift and Record for those looking to create looser sequences. The step sequencer is accessed by hitting the Step button, next to which is an Accent mode, which allows for accented notes to be inputted on a per-track basis. Sequences can be duplicated and extended to up to 64 steps, while a Last Step function allows sequence lengths to be easily abbreviated. A Shift press lets user select from a range of five time signatures, ranging between 1/8 and 1/32. By holding down a step and turning the Swing rotary, it's possible to nudge individual beats off the grid a little, allowing patterns to be fine-tuned. Meanwhile, Copy and Erase buttons help speed up the overall pattern creation and editing process, while Solo and Mute modes let users patch tracks in and out on the fly. One of the most interesting features of the DrumBrute is its Polyrhythm mode. With this engaged, sequence lengths can be set independently for each track, making it easy to experiment with more unusual rhythmic patterns and time signatures. The Pattern Effects section allows for patterns to be mixed up further. Here we have a Swing rotary, which can either be applied globally, or set individually for each track by engaging the Current Track button. Next to this is a Randomness control, which can be used to increase the likelihood of random beats being introduced into a pattern. Again, this can either be applied globally - which is great for creating bonkers, glitch-like fills - or added to each track individually to, for example, introduce more subtle variation into toplines or snare patterns. Finally, four Step Repeat buttons allow quick 'rolls' to be applied while recording using the drum pads, repeat hits on a step up to four times and also add on-the-fly, glitch-like repeats to the whole beat, at divisions between 1/4 and 1/32. The DrumBrute's signal chain is rounded off by a dual-mode Steiner Parker filter. This features rotaries for cutoff and resonance, along with buttons for switching to HPF mode (from its LPF default) and bypassing the filter. It's a nice, smooth sounding filter; the resonance isn't particularly wild, although this is possibly a bit of a blessing for those planning on using the machine on stage and not wishing to blow any PA systems. If we were being fussy, we'd say it would have been nice to see a few more effects at this master stage - an analogue drive circuit, or maybe some reverb or delay would be great - but this is pure wishlisting rather than a criticism. Given its sub-£400 street price, there's already an impressive amount of features onboard here, and it would just be greedy to start demanding more. The one notable weakness of the DrumBrute, compared to its main rivals at this price, is that it doesn't allow sound parameters to either be recorded into the machine, like the Motion Sequencing on Korg's Electribes, or be automated from an external source via MIDI CC, as is possible with Roland's TR-8. Should you wish to, say, change the pitch of a drum mid-sequence, your only option is to go hands-on and tweak the associated control in real time. This is understandable for an analogue instrument at this price, and personally we enjoy the hands-on ethos of the instrument so don't find it much of a problem. No doubt there'll be some reading this for whom this lack of automation will be a deal-breaker though. Either way, it's certainly something worth bearing in mind. 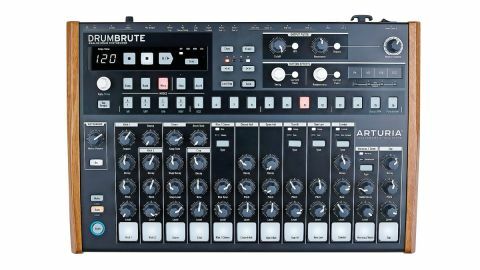 This aside, at this price point the DrumBrute is a triumph. It packs a solid assortment of quality sounds, with a sonic character distinct from its main rivals. Its deep and creative sequencing capabilities are the real highlight though, and coupled with its fluid workflow, they make it a great source of creative inspiration. Kudos to Arturia for pulling it off.